we are manufacturer and exporter of sterling silver and silver plated trays, bowls, and tray sets. Various sizes and shapes are available in trays, like OVAL, OBLONG, SQUARE, TRIANGULAR, RECTANGULAR, ROUND, HEXAGONAL and many more regular and irregular shapes. These trays are a nice gift for any family, be it your friend, parents, near or dear ones. It is also a nice gift as a souvenir from any corporate organization. We offer an exhaustive range of Sterling Silver Trays that are suitable for several usages like promotional events and gifting purposes. Manufactured by using superior quality silver and cutting edge technology by our proficient professionals, these trays are highly appreciated for their excellent finish standards. Further, offered trays are availed in various sizes and designs as per the requirement of our patrons. We are offering customized products. 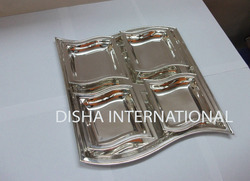 We manufacture silver Silver Plated Tray in different designs, shapes and sizes. Many designs of Trays or Bowls are available with us in all possible sizes. 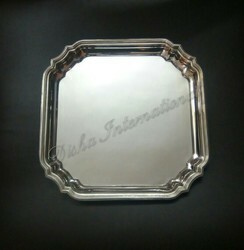 We also make these trays in sterling silver if required. We also customize the design as per buyer's specifications. Polished to perfection by our expert artisans these trays are flawlessly smooth. A perfect gift for any occassion or ceremony. 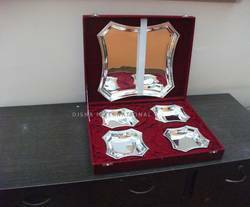 We manufacture silver plated tray and bowl sets in different designs, shapes and sizes. Many designs of Trays or Bowls are available with us in all possible sizes. All trays are available with BOX or without box. Box color can be as per buyer's choice.